One of my personal goals for my thirtieth year, was a heightened focus on my own dental health. Now that I have a child’s dental health to consider as well, the pressure it really on! Disenchanted with conventional toothpastes and what they don’t have to offer, I have been cruising the natural toothpaste circuit for years. I have been happy with a number of brands over the years, but what I am not happy with is the price! As always, in an effort to be more frugal, I set out to make my own toothpaste. The first one was a dud. The second try is brilliant! Dear Husband and my Mom both liked it, and they are my super-duper-recipe-tester-critics who will always tell the truth, so, to get the seal of approval from them meant a lot to me. What is even better is that is my homemade toothpaste uses few ingredients, is very easy and inexpensive to make, stores well in a re-used toothpaste tube, and has unsurpassed dental health benefits. It helps remineralize your teeth, instead of stripping them with harsh abrasives. Let us first celebrate what this toothpaste does not have in it! The star of this show is an unsung hero of the health world and is highly effective in healing dental ailments and maintaining excellent dental health. (It also has numerous other internal and external applications and can be used to make many body care products). An earthen wonder, bentonite clay is like a sponge, binding and absorbing heavy metals and toxins and leaving behind minerals including silica, calcium, magnesium, sodium, iron and potassium in their place. A huge benefit for the mouth. It is alkaline, and a naturally occurring volcanic ash, that has velvety texture with a hint of coarseness. Perfect for a good tooth scrub-down. A good quality clay should be a gray/cream color; never pure white. 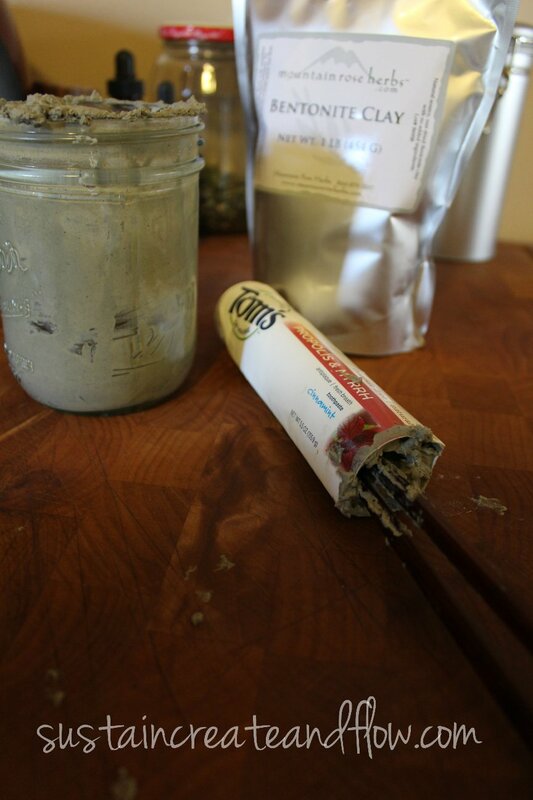 Combine bentonite clay, baking soda and xylitol (if using) in a glass jar and stir with a chopstick or small spatula. (At the time of writing, I substituted stevia for the xylitol because I was fresh out). Note: It is important not to use metals when making this recipe, because the bentonite clay can absorb the metals. Add hot water and stir. Add essential oils and stir. I love the way my mouth feels when I use this toothpaste. I love knowing exactly what is in it and how it was made. I love knowing I can care for mine and my family’s mouths in a holistic, frugal and practical way, while not sacrificing taste or texture. I love the healing benefits of bentonite clay and all of it’s numerous healing benefits. 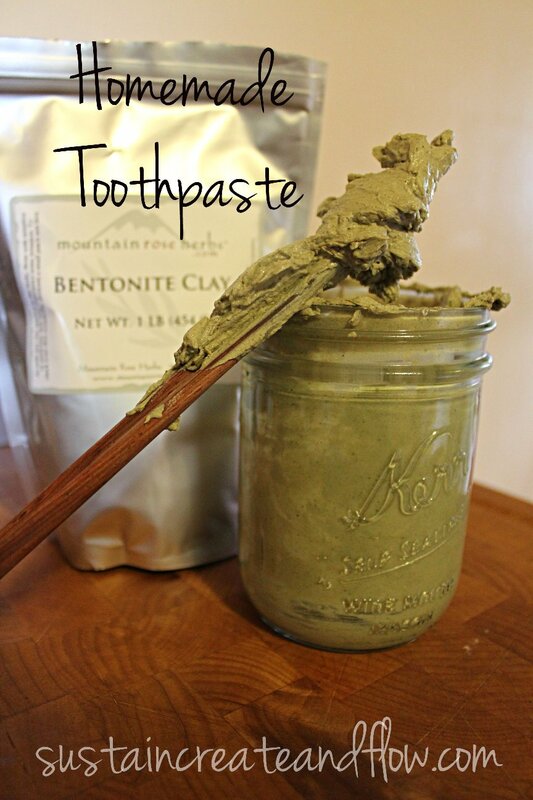 Do you use bentonite clay, xylitol, or homemade toothpaste or tooth powder? What does your oral care routine look like? I love the idea of making my own toothpaste. My 4 year old daughter is hyper and I think it’s been worst since the pink bubble gum toothpaste came in the house. I bet it’s the dye in it. Got rid of it and turned to baby stuff but I might try yours. A suggestion: Next time you fill a tube with the tooth paste, dump the whole thing in a sturdy freezer bag and snip a little corner of it. Then just squeeze it in your reused tube. I tried it yesterday and it was wonderful. My husband refuses to use the tooth powder I make, but can accept this toothpaste. No funky after taste or strange texture. Be careful with the tea tree oil, strong stuff. You should check out the book, The Cure For Tooth Decay by Ramiel Nagel. I loved this book! I have read AMAZING things about that book lately. It’s another one of the “Universe is yelling at me” things! 🙂 I really want to read it if I ever get a minute, which lately is never. *Sigh* I’m off to a good start with the clay though, I know. I have recently switched dentists too to a holistic dentist, and I’m really excited about what I might learn from him 🙂 Namaste, my friend. I love homemade toothpaste. Store bought now feels foamy like frothing at the mouth and just gross. How did you find your holistic dentist? I live where there are hundreds of dentists, but had some claim to be holistic when they weren’t. They still pushed fluoride and drill it out, etc. What about people who still have metal fillings in their mouth, can they use this toothpaste?? I tried making some homemade toothpaste a couple years ago and my husband begged for the “natural” toothpaste from the health food store (which he always complained about before then). My homemade toothpaste was awful and I just haven’t tried making some since. The main ingredient was baking soda with the added xylitol, peppermint essential oil and coconut oil. I am curious about the bentonite clay. How does it taste? Hi Jer. You really inspire me with your talents and creativity. I was reading your blog and I got to the end and wanted to keep reading. You are an amazing writer and you are my inspiration. I look forward to introducing this to my family. Thanks for always being the beautiful person you are to me and everyone around you. The Mountain Rose Herbs website where I bought my kaolin clay says “external use only.” To be safe, I would use bentonite. I have never heard of making your own toothpaste. I will have to give this a try! I am so glad you shared this at the In and Out of the Kitchen link party. I look forward to seeing what you bring next week. Could you combine all the ingredients in a ziploc, mix, then cut a hole into the corner and squeeze it into the tude? You absolutely could, Jody. Great idea. Another reader had suggested that as well. I didn’t think of it at the time. Let me know how it works. Another awesome recipe! I really appreciate the education I got reading this post about what is not in this toothpaste… pretty darn cool. Thanks for sharing another great post on Natural Living Monday! Agreed. It’s probably ok if you aren’t swallowing any. There are swelling and nonswelling clays. Typically the clay for internal use is nonswelling. Bulkherbstore has it or you can buy food grade, nonswelling from Pascalite or EarthWorks. I’m sure there must be other suppliers, but those are the 3 I’m aware of. I thought about what you might use to make it easier to transfer the toothpaste into a container. What about those plastic paint tubes? 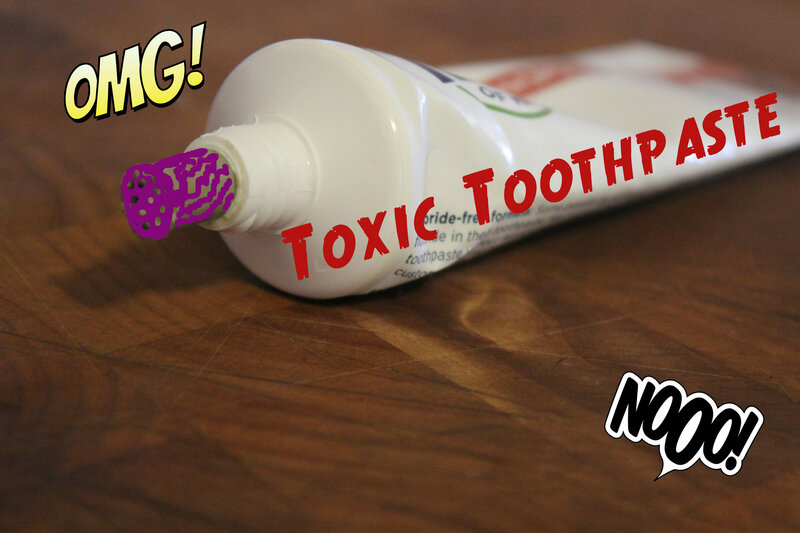 The ones with the tips that screw off, and you could make a cute label to put on it to sit on the countertop… I can’t wait to make this toothpaste & try it! Thanks so much for sharing! I make a tooth powder similar to this. I love it. Thanks for linking up at Wildcrafting Wednesday! This is another idea for a “tube” – how about the reusable pouches for baby food? You fill it through a ziploc type opening, seal it, and squeeze out as normal. A cap is included so no need to worry about it drying out either. There are adult versions of these pouches too on Amazon (if you don’t want cute characters on your pouches!). 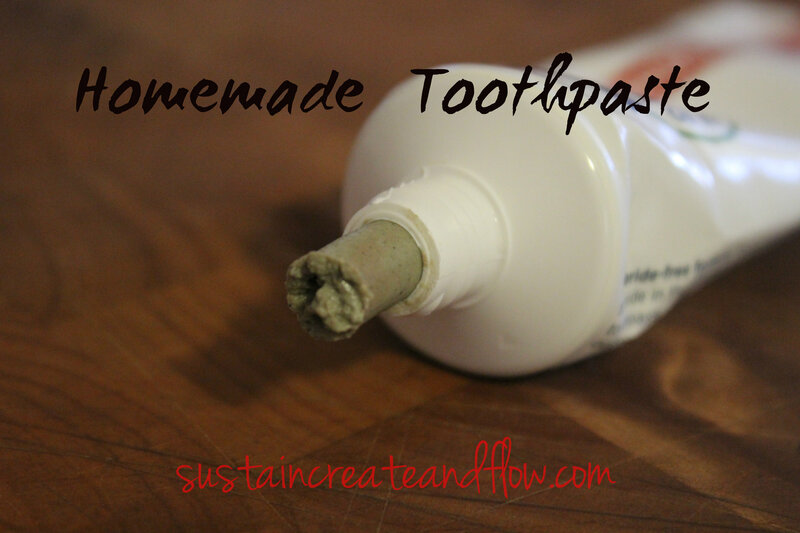 I bought a very similar homemade toothpaste at our Earth Day festival and am so glad I found your recipe. Now I can make it myself when I run out. I love the stuff!!! It is much better feeling and tasting than the conventional brands. Despite my strong dislike for dentists, I am somewhat anxious for my appt in a few weeks – hoping that my teeth have improved! With the addition of water, how long will this keep fresh for? Do you think this recipe would work with aloe Vera as the fluid content? Thank you so much for the recipe. Just be careful with xylitol. Is it safe for my kids to swallow this toothpaste? I personally would allow my kids to, but it’s definitely an individual choice. I’m not a Doc, so I don’t want to make strong statements, especially when it comes to children 🙂 Many people worldwide use clays internally for medicinal purposes, and Katie, from The Wellness Mama has a GREAT post on bentonite clay. Check it out, it may help you make your decision. I would say it also depends a bit no what essential oils you use – some companies use nasty ingredients in their “pure” essential oils that I would not want to swallow! I didn’t notice if this was already asked, but can coconut oil be added to this recipe? Just curious – do you think one of those toothpaste tube crimpers would work on the end of this instead of the tape? Maybe if you did not fill it all the way?…. Most definitely! My Husband had that idea, but we haven’t picked one up yet. If you try it, let me know what you think. Hello I wanted to know if I have to add xylitol to the tooth paste? Also could I just put the mix in a jar instead of a tube? No, you can totally omit the xylitol. I don’t sweeten mine at all anymore and I like it better in fact; but, I also HATE sweet toothpastes. You can keep it in a jar too, but if multiple family members are using this, give each person their own jar. Toothbrushes and mouths are great places to find bacteria and you don’t want to contaminate your paste. Okay Thank you so much! I look forward to trying it! I have been make my own toothpaste for a while now. I tried another recipe using bentonite clay from another website and it hardened like concrete overnight! Not one of my best moments. I will try this recipe as I already have all of the ingredients. Hi, thanks for the new toothpaste idea. I’ve been using a combo of baking soda and glycerine, but you say the latter is not good? Could you say what’s wrong with it? Also, regarding the clay, will it corrode a stainless steel spoon, if the spoon is left in a bowl of the stuff? Thanks for your help! I was wondering if I could substitute tea tree oil with anything else? The link to the clay that you shared says, “For external use only. ” None of the other clays on the webpage state this, so I’m curious about the safety of using this for toothpaste, especially for kids! Do you have thoughts or research on this? Thanks! I’m really excited to try making toothpaste, just can’t figure out the ingredients to use. An idea – you could use one of those ‘squeezie’ reusable pouches for the toothpaste! http://www.pouched.com.au/pouch-packs/400ml-food-pouch-packs. You could even purchase some of the ‘animal’ styled one for infants. In your opinion how long do you feel this stuff lasts in the tube/jar? I’ve always wondered how long the clay stays ‘activated’ after its been hydrated. Our toothpaste batch lasts us a few months. Never any problems with it 🙂 Great pouch idea, btw! We use reusable food tubes (such as the ones you would put condiments in to go camping). I found them at an outdoor supply store. They come with their own clamp on the end of the tube. For the thinner toothpastes it is better to use a ‘reducer’ in the mouth of the tube. I stole one from a condiment bottle. Works great. We’ve been using this recipe with a few tweaks for quite a while now. I know the tea tree is supposed to have antibacterial properties but my kids hate the taste. Anything I can substitute? Thanks. Cool 🙂 🙂 🙂 ,but fluoride is essential for your teeth. otherwise,amazing!what is your Facebook page? Hi. Thank u for the answer. European citizen here so I have no idea in American’s metrics ^^. Just order my bentonite from ebay, got baking soda powder as well, instead of pepermint essential oil i will substitute it with Black see oil extract. Gotta try this because Im sick of having chemicals in my body. Thank u very much for the idea, when I was looking for a recipe ur website was the first i saw. Someday, (well maybe never), I will properly update this post to reflect that it is waaaaay easier to, once your mixture is combined, place this all in a plastic bag and cut the tip off to pipe it into the tube, like a baker would. Also, over time, I found some reuasable silicone squirt tubes, (on Amazon) and I have been using it for the tube. It’s working out GREAT!!! !